Back in February I obtained some court documents relating to a psychotherapist who was on a fitness to practise hearing with the UK Council for Psychotherapy. The case was a failed attempt by John Smalley, a Jungian analyst, to have a judicial review of his hearings on the grounds of delay. Since then a copy of the final ruling has landed in my e-mail inbox. On 16th March 2012, the UKCP complaints panel decided that seven allegations had been proven, but that these did not impair his fitness to practise, and that there would therefore be no sanction. From the time a complaint was originally received by his UKCP member organisation, it’s taken a grand total of three and a half years to reach this conclusion (over 3 years of which were spent in UKCP’s Central Final Appeals (CFAP) and Central Complaints (CCP) procedures), stringing out both complainant and registrant for an inordinate length of time. The case illustrates some of the problems in complaining against a UKCP-registered psychotherapist. 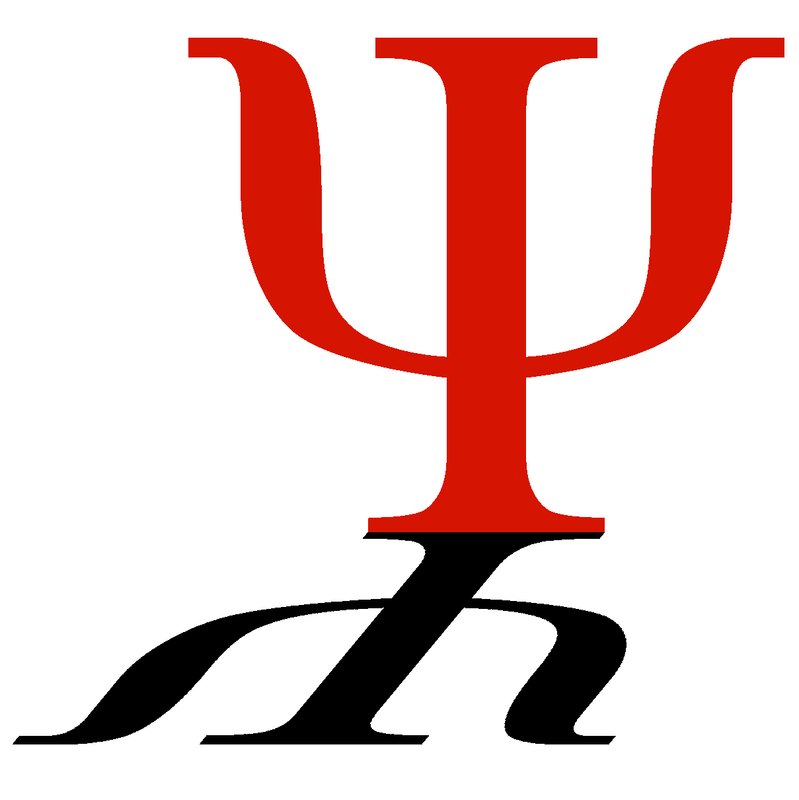 Mr Smalley is a member of the Independent Group of Analytical Psychologists (IGAP), which is a member organisation of the UKCP. Currently anyone making a complaint must first complain to the member organisation. If the complaint is rejected, they can then appeal to the UKCP. This process has such a poor reputation that even the UKCP’s own former chair recently admitted that, “There has been too much crony-ism and amateurism in the conduct of complaints for far too long.” The UKCP complaints archive is surprisingly small. In fact, it lists only two decisions in the last three years – one of which was Derek Gale, a notorious abuser who was struck off by the Health Professions Council before the UKCP struck him off. At present the UKCP is moving towards replacing this two-tier system with a single Central Complaints Process (CCP), though this has reportedly been met with resistance from some of the member organisations. 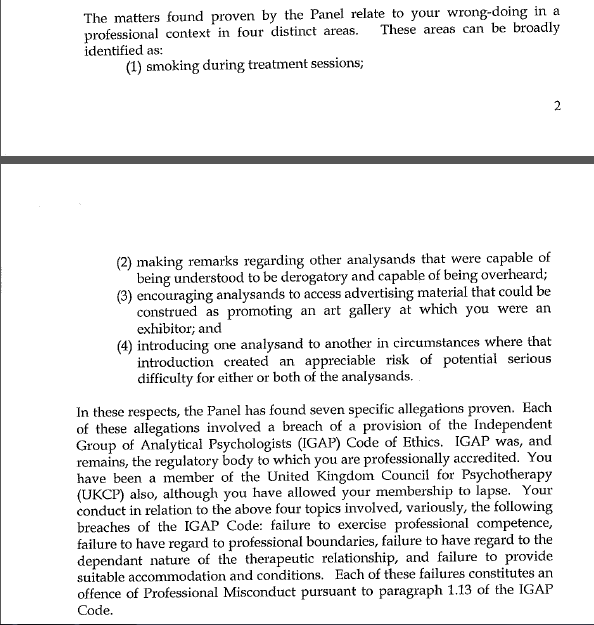 In August 2008 IGAP received a complaint against Smalley from a former client (or analysand, as they’re sometimes called in psychodynamic therapies). IGAP initially ruled in November 2008 that there was no case to answer, and also turned down an appeal in January 2009, but the complainant then appealed this decision to the UKCP’s Central Final Appeals Procedure (CFAP) in February 2009. The CFAP ruled that IGAP’s decision had been “perverse and incorrect”, and ordered that the case be heard before the new Central Complaints Process. Incredibly, it took them until March 2010 – over a year – to come to this decision. Cue another year and a half of procedural faffing and delays, resulting in the attempt by Mr Smalley to have a judicial review on grounds of delay, before the final UKCP hearings were scheduled for December 2011. And finally in March 2012 (another four months later!) the UKCP gave its ruling. A number of other allegations were found to have been not proven. The panel ruled that Mr Smalley had reflected on his errors, that there was no evidence of financial gain from his misconduct, and that no other complaints had been received. For that reason they decided not to apply any sanction. It’s taken three and a half years from the time IGAP first received a complaint, and over three years since the complainant first lodged an appeal with the UKCP. All to arrive at this not-very-impressive result. For comparison purposes my own regulator, the Nursing and Midwifery Council, aims to resolve Fitness to Practise hearings within 18 months. During the process, Mr Smalley’s services continued to be advertised on the IGAP website, with no mention that his fitness to practice was being called into question. From what I’ve been told, it sounds like both Mr Smalley and the complainant have remonstrated bitterly about this inordinate length of time. I e-mailed IGAP for comment, and received the following reply. In response to your queries we have to state that IGAP’s ethical obligations about confidentiality prevent us from giving information beyond publicising the outcome of a hearing where there has been a breach of our Code of Ethics and Practice. In the case you mention we confirm that IGAP found no case to answer. We cannot confirm the statements you made referring to UKCP. Our fitness to practise and complaints processes aim to be fair, transparent and proportionate, and to work in the public interest. At present we have a two-tier system, with our organisational members dealing with the first stage of a complaint and UKCP acting as the appeal body. This can mean that cases take longer to conclude than we would like. We work hard to reduce delays but sometimes they occur for reasons outside our control – for example, the availability of all parties. This particular case took longer than normal, partly because it was considered by two separate panels when an appeal panel referred it to UKCP’s Central Complaints Process. We are confident that we gave sufficient opportunities to the parties and their legal representatives to put forward their views to receive a fair and transparent consideration and this inevitably lengthened the timescale. We had four public hearings, including a two-day hearing, one judicial review application, both in writing and a high court hearing. The parties were able to present their views, and all parties were legally represented. There was further delay when one hearing had to be adjourned because of circumstances beyond our control. The final hearing of this case was decided by an independent panel, and they documented their decision and reasons. Complaints against UKCP psychotherapists do not normally take 3 years to resolve. In fact we have never had a case like this one, and hope we never again have a case that takes so long to resolve. We recognise that there is room for improvement and we are committed to review and improve our processes. For example, we are currently introducing a centralised complaints system which will replace the two-tier system. This will be in place for all UKCP registered members by the end of next year. I e-mailed Mr Smalley for comment, but did not receive a reply. If I was a client of a UKCP-registered psychotherapist, I’d be worried about this. If I were to make a complaint, I’d like to feel it would be processed without excessive delay. Likewise, if I was a UCKP registrant, I wouldn’t be very happy either. I wouldn’t want to be strung out for three years wondering whether I might be struck off. At present there is no statutory regulator for psychotherapists, though organisations such as the UKCP are supposed to provide self-regulation of the profession. The previous Labour government was proposing that psychotherapists become regulated by the Health Professions Council, which currently regulates arts therapists, occupational therapists and clinical psychologists. The Con-Lib coalition shelved that plan in favour of a proposal for “assured voluntary registration” where the likes of the UKCP could apply for an official stamp of approval from the Council for Healthcare Regulatory Excellence (to be renamed the Professional Standards Authority). This case appears to show that the UKCP’s complaints system has some serious problems. The therapist’s member organisation decided there was no case to answer, even though he was smoking in therapy! It then took over a year just to agree to hear the complainant’s appeal and send it forward into the new Central Complaints Process. But even then the CCP took two years to find at least some of the allegations proven, but not do anything about it. Is the UKCP ready yet to receive approval from the CHRE/PSA? I’d say this case raises some question marks about that. This entry was posted in psychotherapy, Uncategorized and tagged igap, john smalley, psychotherapy, regulation of psychotherapy, ukcp, Uncategorized. Bookmark the permalink. The UKCP’s handling of this can be summed up in two words: “Crass amateurism”. Voluntary registration will not work. If (some) psychotherapists remain resolutely opposed to the HPC, call their bluff and establish state registration with a General Psychotherapy Council (I date from the days of the General Nursing Council) with the right of appeal to the Privy Council, or to the Divisional Court and thence to the Supreme Court. This tragic tale tells us just how ‘cut off’ this organisation is from service users. How can they therefore process complaints effectively and fairly. They appear to have had zero compassion for the complainant and they cannot see why a three year complaints procedure is so wrong. The Chair should make a statement on this. A couple more thoughts from me. It doesn’t particularly impress me to hear from UKCP that “we have never had a case like this one” – not when there’s only two decisions in the complaints archive from the past three years. Is that really the only two people they’ve sanctioned in recent years? Given the length of time taken to process this complaint, it leaves me wondering whether there might have been other complainants who simply gave up.